Here you can put your digital photo's on cd-rom. The best street for shopping in George Town is Penang Road. Here you can buy cameras and portable radios duty free. Always ask for a warranty card for cameras, watches and electronic goods. Make sure that the voltage of the electronic items is compatible with the voltage at home. Start your shopping in Penang Road at Jalan Macalister. Take the walk-over at Jalan Burma until you reach the police station. It's lovely to walk along all those little shops on Penang Road! Opposite the police station is the wet-market. Step into the wet-market. You can smell the fish, although there's a lot more to buy. When you use the stairs and go up, there are also clothes available. Listen to the dealers and their prices. Once you get outside, you should take the first road on your right: Lebuh Campbell. It's not as busy as Penang Road, but it's also a nice shopping street. If you take the first street on your right again, you are in the street at the backside of the wet-market. In the morning they sell all kinds of goods: fruit, fish, antique household and even Chinese clogs. If you keep on walking you'll see a big round building. This is the Komtar (shopping mall). The Komtar is the most famous and oldest shopping mall in the centre of George Town. It has four levels and is air-conditioned. Beside all kinds of little shops, there is also one department store: Metrojaya. At the top of the shopping mall rises a 64-floor round building with mostly offices. In the middle of the shopping centre, at the tourist information, you can buy tickets for the elevator . You have to be at street level to take the elevator. When you're up, you'll be amazed by the panoramic view, you can easily see the Penang bridge and Butterworth, which is on the mainland. At street level there's also a bus station. When you're staying at the Rasa Sayang Resort or the Golden Sands Hotel you can take the shuttle bus to town. The shuttle bus stops at the Shangri La Hotel in the centre of George Town. Once you get off the bus there are several trishaw drivers waiting for you to take you for a ride in their trishaw. You can have lunch at the lower level. The shopping centre needs renovation. The Prangin Mall is a popular shopping center in the middle of Georgetown. It's built right beside the Komtar. You can reach it by crossing a very heavy road. Please pay attention when you cross the street. You can also enter the shopping complex by crossing a sky bridge between the two shopping centres. In the complex are also restaurants. There are a lot of shops and in the basement is a good supermarket, where you can buy anything (from liquor till baby food). You can find easily copied software in the upper levels. Outside, at the corner of Jalan Macalister and Jalan Dato Kramat, you'll find "Gamma". A 30-year old department store with a supermarket on the ground floor. It's mostly visited by local people. Another interesting shopping mall with various shops is: 1-Stop. It's a shopping complex for the ordinary people. There are no expensive stores, like Gucci. It's situated in the Midlands. You'll find the complex at the beginning of the city near the Berjaya Hotel. On level 1 you'll find a supermarket. On the ground floor they are selling clothes, suitcases and handbags. In "1-Stop" (air-conditioned) you can buy a lot of copied software, Play station- and Sega games. Of course there are also shops for shoes, sports, clothes and so on. You can take the elevator and go to the top level. There's a bowling centre and a hawker centre. Don't forget to have lunch here! It's much nicer than the McDonalds down below. On the rooftop of "1-Stop" is also a swimming-pool with slides for the children. The shopping centre is only visited by local people. It's alittle bit old and need some renovation. When you're staying in Batu Ferringhi it's easy to go by local bus. A lot of taxi's are waiting to bring you back or to take you to the center of the city. Of course you can also take the local bus! Island Plaza" is situated in Tanjong Tokong and is air-conditioned.. This shopping complex is about halfway on the road from George Town to Batu Ferringhi. It's not as big as "Komtar" or "1-Stop". Penangites say, that "Island Plaza" is built for the tourists, because it has so many international shops, like Nike, Giordano, Guess, Fila, Versace and British India. But.....there are also local shops. Just outside the shopping complex, across the street, you'll find more local shops. You should also have a look over there. Close to the Island Plaza is a Tesco to do your daily shopping. The shopping centre that is furthest away from the city is "Bukit Jambul" (air-conditioned). The shopping centre is old and need renovation. Only local people come to do their shopping. It's nearby the airport in Bukit Jambul. The shopping centre has many levels and there are many little shops. Besides a food-centre there is also a bowling centre and a cinema. At the ground floor used to be an ice-skating rink, but it's closed nowadays. Due to less ice-skaters in Malaysia. Queensbay Mall opened for business on 1 December 2006. It is currently the largest, longest and most modern shopping mall in Penang with a gross built up of 2.5 million sq ft and over 1 million sq ft net lettable area. The Mall is located in Bayan Lepas, minutes away from the Penang Bridge, the heart of a prime waterfront development sprawling over a land area of 73 acres. It is the most preferred shopping destination for both the locals and tourists � with 5 levels of retail� Jusco as its anchor tenant with more than 10 junior anchors and 500 retail merchants. Besides a well-planned tenant mix, shoppers can enjoy the �low rise walk-thru� layout which stretches as far as 500 meters with excellent visibility of the shop fa�ade and merchandizing displays. The facility and amenity signages are meticulously planned to enhance the convenience and comfort of the shoppers. The overall interior design and lightings are aimed to create a conducive and safe shopping environment for the whole family. Added to the attractions are the integrated entertainment zone on the third floor that provides a wide range of entertainment and leisure attractions ranging form multiplex to roller skating. 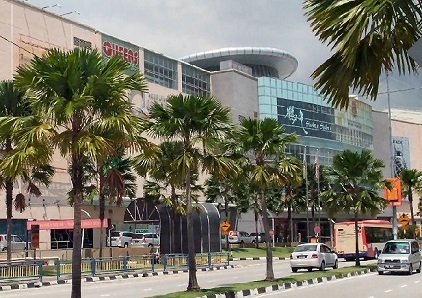 An air-conditioned shopping complex also is "Gurney Plaza". It is situated between Gurney Drive and the Jalan Kelawei. You can see a picture of this complex on the top of this page. It opened its doors at the end of July 2001. 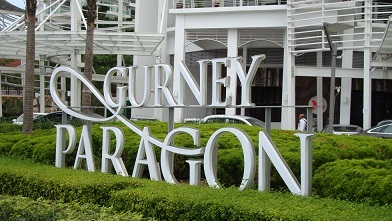 We visited "Gurney Plaza" several times, but is has been renewed. They added a a new "complex of shops" to this complex. It's twice as big as it was before. It is very modern and has a lot of international shops, like Versace, Nike, Giordano, and British India. 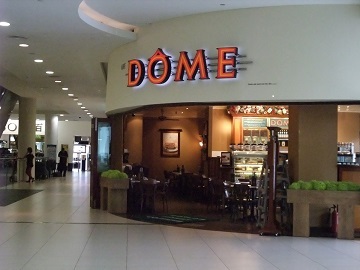 Outside the shopping complex are a lot of restaurant (look at the photo), like the Dome, Starbucks. You can rest a while when you're tired from shopping. Have a drink or a dinner! In the basement is "Color Foto President". Here they can put your digital photo's on cd-rom. There's a good parking garage and the mall is on walking distance from 1-Stop. 1st Avenue is located, as in the Prangin 'Mall Parkson department store with four floors. This is the largest department store chain in Malaysia. A stylish city mall that offers fashion, leisure, entertainment and a slew of dining outlets for the style conscious urbanites living and working in Penang. The highlight concepts in the mall include a mall-in-mall concept at the lower ground level named �Underground� and a lifestyle and entertainment enclave on Level 8 called �Cloud8�. Underground is the first mall-in-mall concept in Penang targeted at the young and young-at-heart. Decorated to theme and bustling with energy and life, Underground comprises fashion & accessory outlets, quick-bite eateries and other retail shops catering to youth and pop culture. The latest shopping complex, which is situated near Gurney Plaza. Gurney Paragon is built around the restored St. Joseph's Novitiate, a heritage building converted into a unique cultural experience. The chapel's stunning colonial architecture is an inspiration for the mall design itself, making Gurney Paragon a beautiful blend of charmingly antique and sleekly modern. Just like Penang itself. Gurney Paragon is also designed with nature in mind, incorporating green spaces and environmental elements to create a garden atmosphere unique amongst shopping malls. It combines the widest variety of shopping and entertainment options with its environmentally-friendly design philosophy to create a genuinely unique lifestyle centre - one that preserves the historic heart and soul of Penang. Truly a one-of-a-kind experience in Malaysia and Asia. Long ago there was a thieves market at Campbell Street. Thieves and smugglers took their things to this market and sold it. All kind of goods were sold. This market is gone. They say, it has been moved to Lorong Kulit (that's the name of the street). That's nearby the football stadium and not far from prison (!). Dealers show their goods on a carpet on the street or at stalls. Sometimes you see someone from Eastern Europe, who's selling binoculars or knives, coming from the Russian army. When you're lucky you can buy a Bulgary watch from Bulgaria. But when the police shows up...........the dealers disappear. Also sold here: fruit, antique, copied dvd, shoes, Adidas coats. All against low prices!